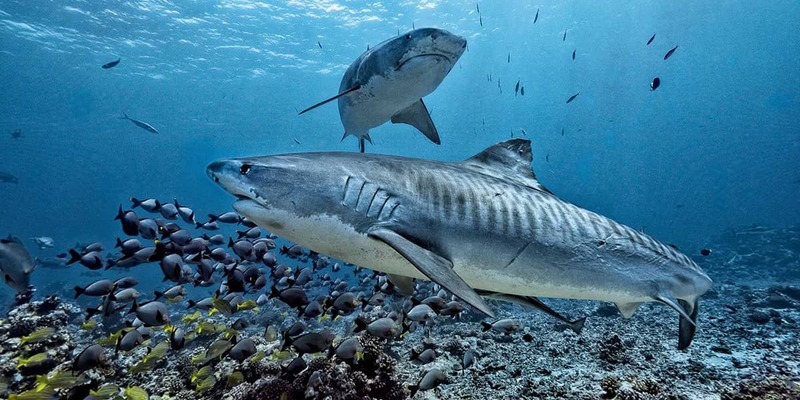 Your Shark Cage Adventure is a once-in-a-lifetime experience that brings you face to face with the ocean’s most feared and magnificent predators. 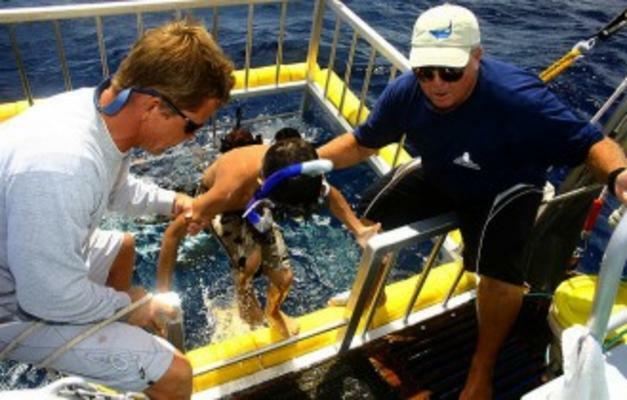 Three miles into the clear blue waters of the Pacific Ocean, when the water reaches depths over 200 feet, a specially designed shark cage is lowered into the water where it floats while attached to the 26-foot boat for adventurous passengers to snorkel with sharks in safety. 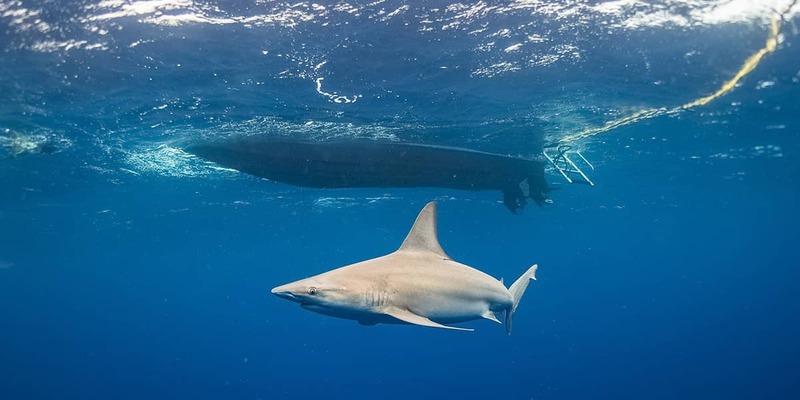 Those who are nervous about getting into the water with sharks will be relieved to see that the cage is buoyed so that its open top is well above the surface of the ocean, making it impossible for sharks to get inside. As soon as the cage is lowered, curious sharks will rise up to investigate. 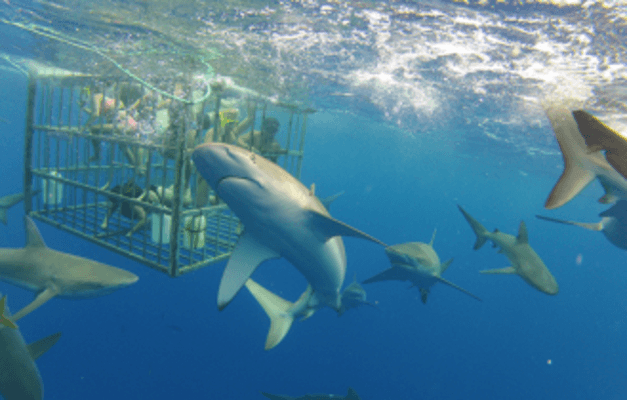 Guests are invited to walk from the boat directly into the large cage and either snorkel or keep their heads above water – with whatever they are most comfortable. 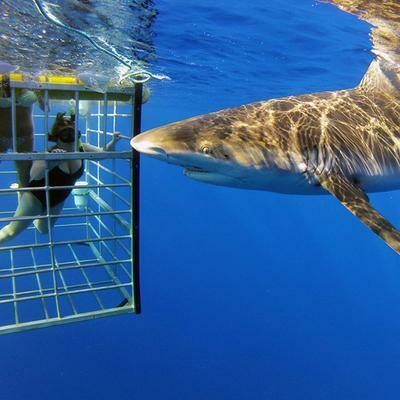 The cage has steel bars with thick clear Poly glass windows to put you nose-to-nose with sharks…. 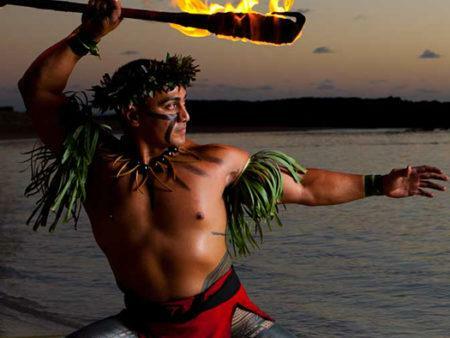 Visitors will mostly see Galapagos Sharks and Sandbar Sharks, some of the biggest coastal shark species in the world. They can grow up to 15 feet long and sometimes appear in groups of up to 30 individuals, making for a truly spectacular encounter. Sometimes you will even see tiger sharks and hammerhead sharks. 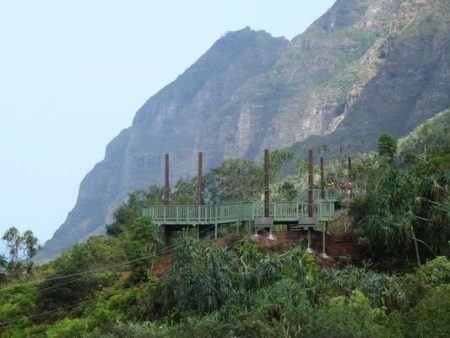 The clarity of the warm Hawaiian waters coupled with the large cage designed to enhance visibility means snorkelers will have unobstructed views of the sharks surrounding the cage from within its safe barriers, close enough to touch the remarkable creatures while remaining completely secure. 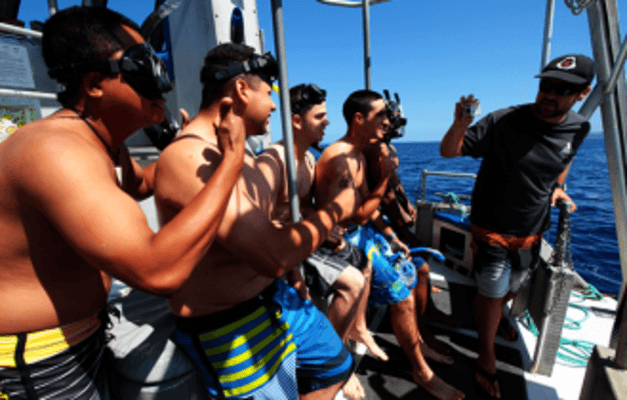 Experienced and knowledgeable guides conduct the trip, so not only will you get a new perspective on sharks by visiting them up close in their natural habitat, but you will also learn a lot about them from the crew. 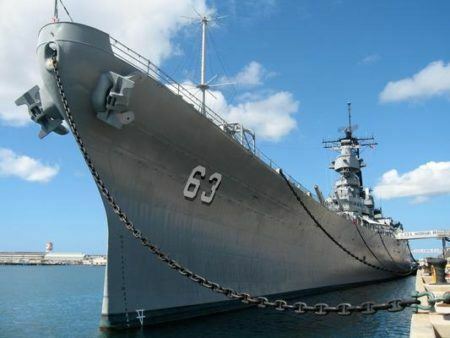 This tour is understandably very popular so should be booked in advance and planned for the beginning of your vacation in case weather conditions have to delay the trip. They even offer a money-back guarantee if you don’t see any sharks. The experience is designed with the comfort and enjoyment of the guests in mind. 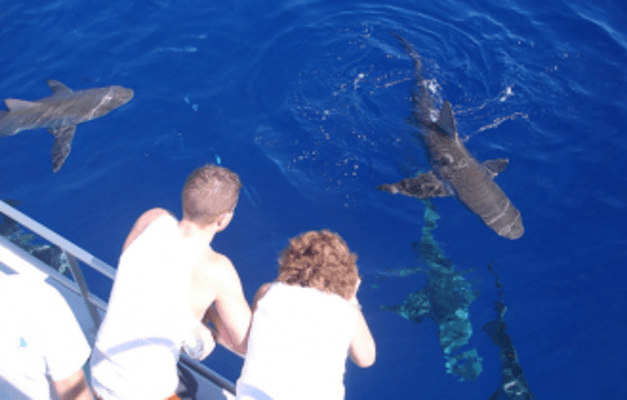 There is a half-price observer ticket option for those who do not want to get in the cage, but all passengers experience the wonder of seeing sharks in the clear water from the boat’s deck, with the added possibility of seeing whales, dolphins, and sea turtles during the trip. 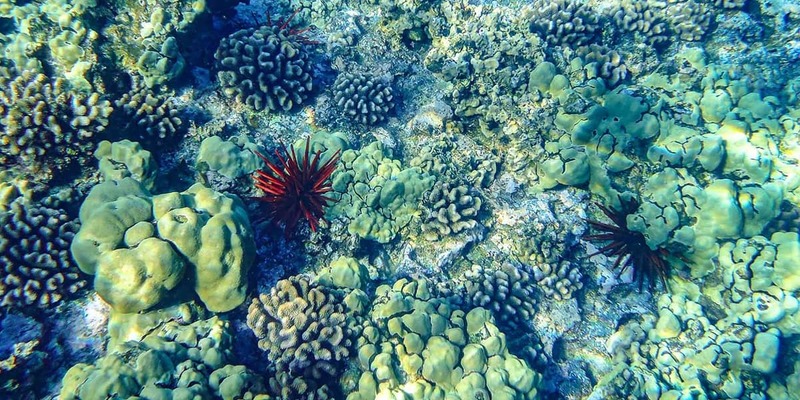 Those who do venture into the cage can stay for as long as they want, floating or submerged with snorkels, with the ability to move freely around the cage for the best views.